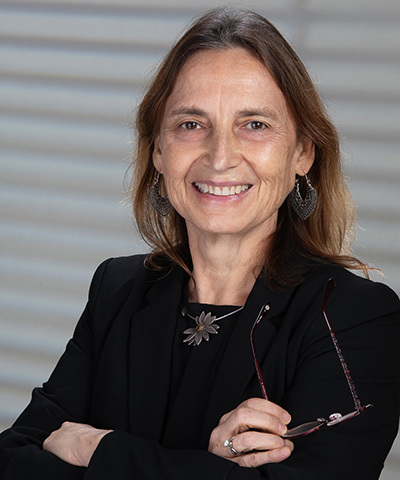 Jannick Rolland is the Brian J. Thompson Professor of Optical Engineering at the Institute of Optics at the University of Rochester and CTO of LighTopTech, she co-founded. At the University of Rochester, she is the Director of the NSF I/UCRC Center for Freeform Optics (CeFO) that focuses on graduate education and Director of the R.E. Hopkins Center for Optical Design and Engineering that engages undergraduates in optical design, fabrication, and metrology. She earned a Diploma from the Institut D'Optique in 1984, and MS (1985) and PhD (1990) degrees in optical science from the University of Arizona. As a postdoctoral fellow in the Department of Computer Science at the University of North Carolina at Chapel Hill, she focused on learning vision and computer graphics while designing stereoscopic head-worn displays for medical visualization. She also headed the Vision Research Group for Medical Displays (1992-1996). In 1996, she joined the College of Optics and Photonics at the University of Central Florida (1996-2008) where she built the Optical Diagnostics and Applications Laboratory (ODALab). In 2009, she joined the Institute of Optics at the University of Rochester as the Brian J. Thompson Professor of Optical Engineering. Professor Rolland served on the editorial board of the Journal Presence (MIT Press) (1996-2006), associate editor of Optical Engineering (1999-2004), and is currently associate editor of Optics Letters. She is a fellow of the Optical Society of America, SPIE, and NYSTAR. She is the recipient of the 2014 OSA David Richardson Medal and the 2017 Edmund A. Hajim Outstanding Faculty Award. Professor Rolland's central research interests are in the fields of optical instrumentation and system engineering. Research areas of interest are (1) optical system design for imaging and non-imaging optics with a current focus on freeform optics, (2) physics-based modeling, and (3) image quality assessment. These areas have been applied to eyewear displays for augmented reality, optical coherence imaging, biomedical and medical modeling and simulation, and the alignment of optical systems. Her research interests continue to focus on optical engineering innovations in relation to imaging and visualization across a wide range of driving applications.